Designed for professional use, the Heavy Duty Circle Cutter will make clean cuts from 1-3/4 to 7-7/8 inch diameter. The tempered steel body features marked graduations on the beam for fast measurement and application. #55 Heavy Duty Circle cutter is designed with a 1/2 shank for drill press use only; Maximum safe speed is 500 RPM. 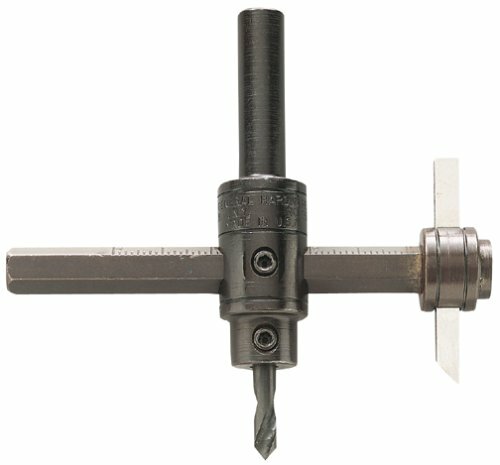 This round shank circle cutter is great for making smooth cuts through most materials, including wood, composite, sheet metal and more; Shank is 1/2 inch round. All adjusments are made with a hex wrench which is included; Replacement blade is General Tools Model # 55 Blade, replacement drill is General Tools Model # 5/6/55 Drill. View More In Hole Saws.